Jenn and Boogie join them in the HOH room. Talk is about the coaches picks during the beginning of the game. They are kind of surprised by Dan’s pick. Boogie tells him he would win 25K if he lost his virginity for sure. 11:43pm cam 1-2 HOH Room Britney and Boogie Talk is about getting dropped back into the game. Boogie isn’t sure because if he has 3 going into final 7 he’s got a real good chance of winning the 100K but if he gets dropped into the house with all these people he’s got a smaller chance. Britney just doesn’t see there being enough players to finish the season. Boogie says if they get dropped into the game he would like Dan out of the game because he’s so freaking dangerous. Britney was going to use it to save Shane. Britney and Boogie agree that Shane isn’t too intelligent, He’s a great physical threat but to call him the best competitor in the house is a stretch. 12-12-45AM Random conversations General hate towards Willie, JOJO and Brintey. Janelle, Wil and Joe producing most of the hate. They are told by production to stop speculating about Willie having a drug and alcohol problem. 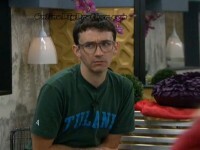 Joe is trying to push heat onto Danielle and Jenn sayign that he’s heard rumors that they are not who they say they are. Janelle absolutely hates Willie and is pretty pissed at Britney. Wil talks decent smack about Jojo. I wonder if they’re going to have a double eviction this season since Willie is gone. I’m really going to miss all of the drama that Willie brings in the house. I’m going to miss Willie too. I don’t agree with all of his actions (I mean, definitely not his actions of today), but I don’t think he’s quite as bad as everyone is making him out to be. Then again, I wasn’t locked up in a house with him. ;) It’s definitely going to be less exciting with him gone. I was hoping he’d win…but, now that he’s gone I have to cheer for Ian. He’s just so sweet and “adorkable.” Plus, I like underdogs. I’m hoping we get to see something of the fight this Sunday…just so I can maybe get a bit more insight into why Willie did what he did. I think he’s got a good heart, but could definitely benefit from some anger management classes. I haven’t counted the weeks left vs. players left, but I think the only way they can have a double eviction is if they bring someone back. Maybe someone who’s counted the weeks left vs. players left can better answer that. this looks so good on AG. Guess she’ll be using the “production has the option to alter the game at anytime claus”. Bringing back these “coaches” has back fired on her and now they have to scramble and come up with something to try and save this season so early in the game. Maybe now AG will learn bringing back old guest and people living off other peoples name is not a good idea. Please if someone can explain to me how Brittney is one of the best players ever to play the game tht would be great. To hear her speak like the house guest her puppets and do whatever they tell them to do makes me laugh coming from the person that was rail roaded the hardest and ws to ignorant to see Lane was just stringing her all season. Anyways, I hope AG goes down in flames this season and teaches her a valuable lesson. BB it not what it use to be. Thanks for your work Simon. I’d sooner read your work here then give AG any kind of ratings. Of you don’t like BB anymore then go watch the rip off show on that other network! I’m sure it is so much better! This show is not BB anymore. AG has messed up what was good show. Bringing back old house guest, letting people have safety for 4 weeks, letting people BACK into the game after they were voted out. Altering competitions to try and keep certain players in the game. This is not the way it was in the past, when the game was much better to watch. Total agreement. She is running a great show into the ground. More power to straightshooter Joe, yo! I wonder when the house will realize its Joe causing all the drama! He’s playing a good social game, if he is making up lies about people that could ruin that person then he needs to go see a doctor stat! CBS Production should bring back Kara back & coaches entering this game. I work one day and i miss all the goodies, guess im going to have to take the rest of the summer off. Too all the Willie haters he really was the least insane of the Hantz brothers. He didnt go about certain things the right way sometimes but his intention were good. He sacrificed himself thinking he could save JoJo n Shane, but production doesn’t want players to control the game regardless of the ratings. As far as headbutting Joe i sincerely believe he deserved it, should’ve gotten a few more shots in if you ask me. Sidenote, the day Joe gets evicted should honestly be a holiday. Joe definitely likes to stir the pot. I can’t stand him! He needs to go! I wonder how long it’s going to take for all the other HGs to figure him out! I like Dan and I’d lik to see him stay a little bit longer in the game. I dont like Mike, Frank or Wil-they need to go too! I don’t mind Joe so much. You need a pot stirrer in a game like this. What started the fight? Was anyone actually “HIT”? do you think it was planned? I fell asleep and woke up to bits and pieces at 1:00am EST of willis and a fight and he’s no where to be seen? does anyone know where a blow by blow is of the fight and who was involved?